We look forward to your visit! Please take some time to become familiar with our area by using the above map. Below are instructions for getting to Sundaram. Please contact us if you have further questions about transportation and location. San Francisco, or San Pancho as it is more commonly referred to, is a Mexican town situated in the State of Nayarit on the central Pacific coast of Mexico about 50 km north of Puerto Vallarta on Federal Hwy 200. 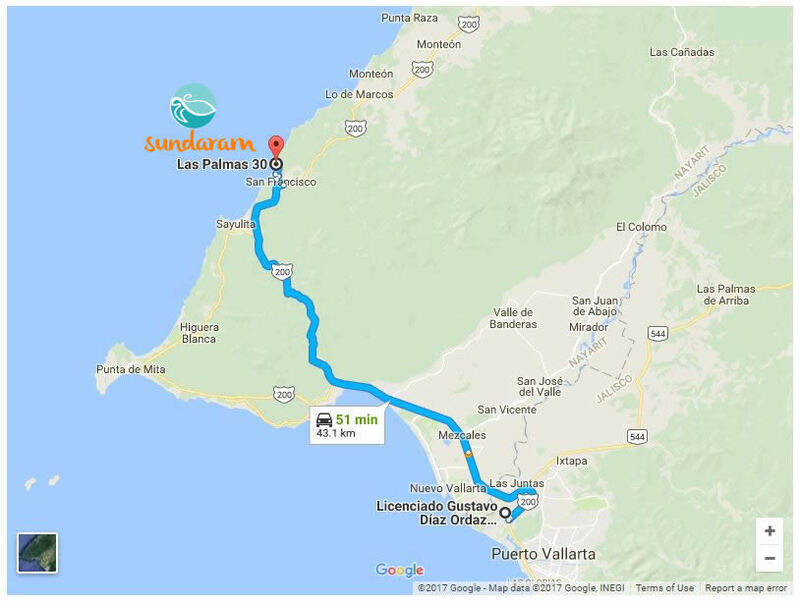 Continue in town in Avenida Las Palmas, pass the Las Huertas Golf Club, pass the Maraica Hotel, then, on the left side, towards to ocean, you will see a huge Palapa and large modern building which is the Patrona Polo and Beach Country Club. After this building, on your right side, there is a small street, right before a left turn into Islas Street. This is Palmas 30, called Retorno Palmas. Right in front of the parking lot of Mar Plata Restaurant you will see SUNDARAM on your right hand side. Continue to the end of the house. We can arrange a private van, with air conditioning, that will pick you up from the airport, take you to Sundaram and then return you to the airport when you are ready to go back home. The drivers are very experienced. The price includes a one hour stop in the biggest super market that has everything including an organic section, so you may buy your own groceries and fresh produce, drinks, beer, etc. The ride also includes cold drinks for you to enjoy. The cost is 140 dollars (pick up and drop off) and you pay the driver directly in cash. Tips are additional. The same driver service is available for private hire to take you around and visit wherever you wish. Reservations ahead of time are strongly recommended. To get this service, while at the airport, you need to cross the pedestrian bridge over to the other side of the highwayand call UBER. UBER is not allowed to pick guests up from within the airport property. San Pancho is bordered by jungle that is home to the jaguar and scores of other exotic mammals, reptiles, amphibians, and bird species. The region is also notable for its floral diversity.